I have had so much to write about this summer but it’s only now that I’ve arrived in Korea and have started my documentary work here that I feel it’s necessary to record everything. So here begins a recap: this summer, I interned at Serious Eats as an editorial intern, which was not a very challenging experience but rather something that gave me exposure to a real work environment — albeit a very relaxed one. I realized my food writing needs a lot of improvement, that I need to be more curious about the food itself and the experience, history and science of buying it, preparing it and enjoying it. I’d really like to expand my vocabulary to be more sensory and accurate in describing tastes, textures and smells. On another note, I’ve also realized that I need to be more curious about my relationship with Chris and I’ve developed a newfound dedication to improving our life together in a proactive way rather than falling into the same mistakes and bad habits over and over again. I think it’s working. This summer was really another trial for my depression, my relationship and self-esteem. But in the end, it’s pushing me to move forward and quit my addiction to complacency. I think the key to breaking away from this complacency is creativity. What used to fuel me as a teenager was a love for art, music, reading. As my depression made me slowly lose interest in all my previous hobbies, I think I’ve lost a lot of color in my personality as well. There’s not as much tangible passion that leads to growth. A lot of it is bursting out in these random directions without any guidance or fruition. It’s developed into a jumbled, disorganized energy that can’t find any ventilation. Kind of like a restlessness that can’t be relieved and remains suffocated under this waxy dense layer of indifference, that loss of passion and interest in the world around me. Journalism has been a great remedy for this, letting me at least gain some passion and curiosity back. But that’s only one sector through which I should be exploring and expressing myself. I’m rambling. After I finished my internship and ended my summer in Jersey, I came to Seoul with my brother. He stayed for two weeks during which we spent equal amounts of time bumming and going out. It was a good time — especially before he went off to college (!!). And now I’ve started working on my documentary project on LGBT life in Seoul with Sunny. Basically it’s been incredible — meeting so many amazing people, hearing their stories, discussing in depth the issues that pervade Korean culture, the history that has produced today’s society and so much more. It’s been invigorating to say the least. More details to come in my next post. 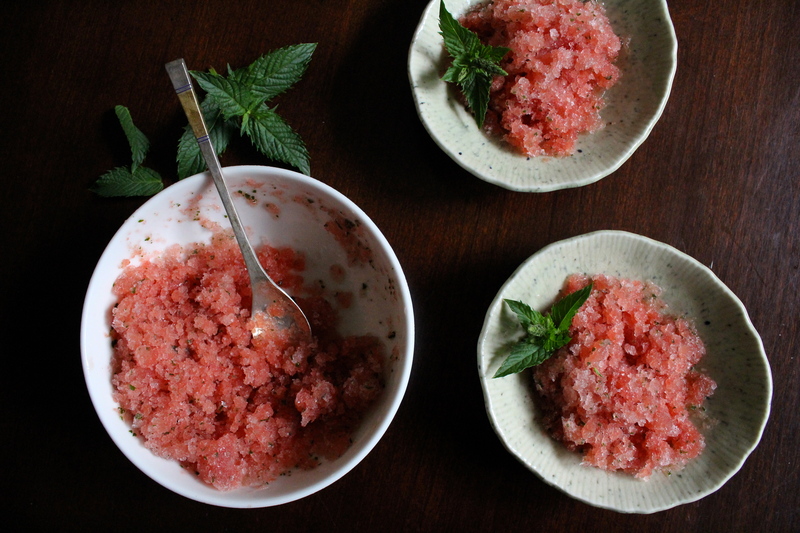 Anyways here is my recipe for the most refreshing watermelon-mint granita. 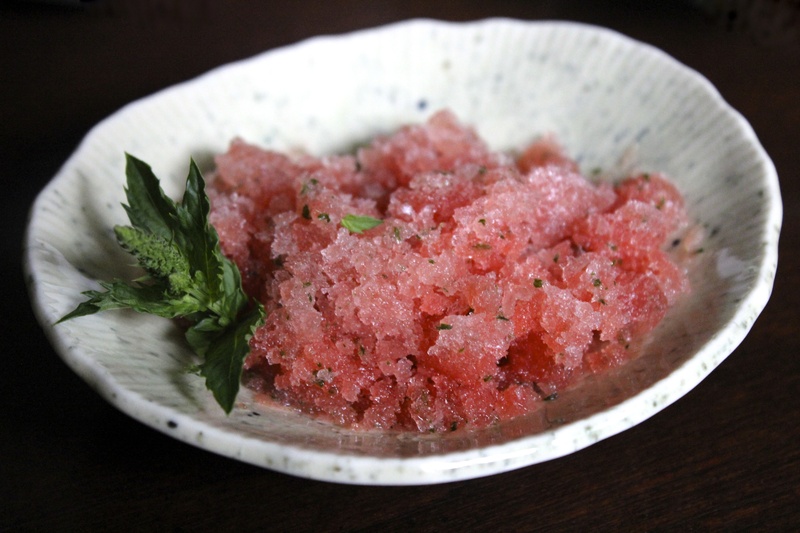 The flecks of mint leaves a tingly, cooling sensation on your tongue and the cold, fruity watermelon tastes as much like summer as any dessert could. It’s the perfect dish to serve when it’s hot and sticky out and you need something to immediately cool you off. 1. Fill a magic bullet with as much watermelon as you can fit. Add in two spoonfuls of sugar and 4-5 leaves of mint (2-3 if you don’t want it too strong). You can also add a tablespoon and a half of orange/grapefruit juice if you don’t want it to be one-note. My dad complained that the flavors were boring — I didn’t mind it. 2. Blend until everything has liquified. Pour into a bowl, cover in plastic wrap and freeze. 3. 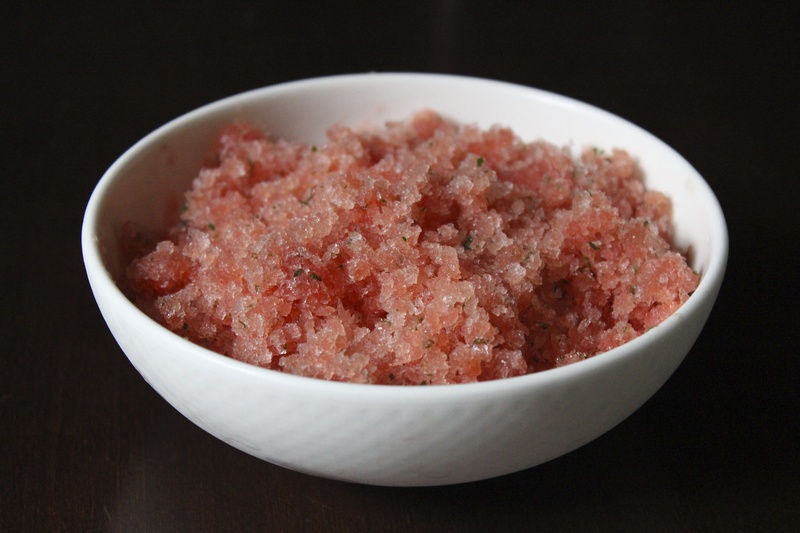 When the mixture is completely frozen, start scraping into it with a fork until the entire bowl has been broken up into tiny flakes of watermelon ice. Serve with a sprig of mint. Readers, sometimes I eat simply to pass time. Sometimes to console myself from stress or emotional turmoil, other times as an excuse to hang out with friends. Most of the time, I just eat because the food tastes good…that’s a good enough reason, right? Right??? Ah, well, there goes my healthy diet. 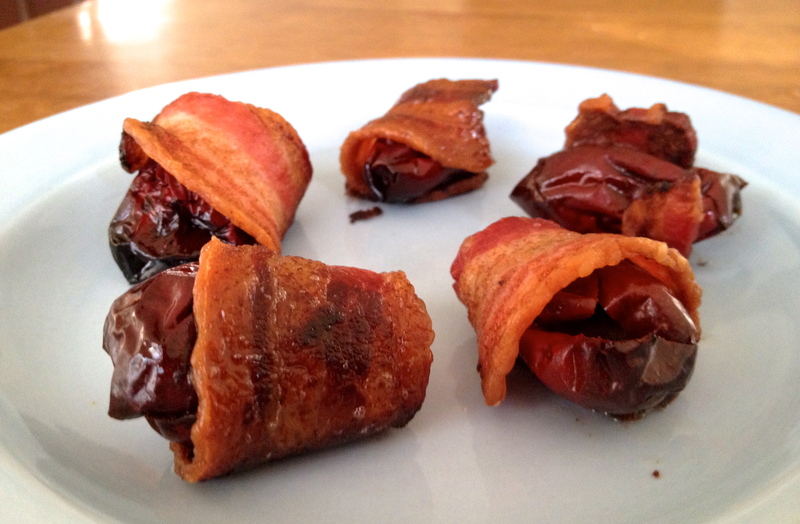 At least with these bacon wrapped dates, I can say I was taste-testing for holiday parties coming up ahead. As far these little gems are concerned, that’s a more than good enough reason for stuffing my face with them by myself making a mini-preview batch. They’re so easy they totally debunk the idea of “x amount of effort = x amount of reward.” With minimal effort and big reward, the proportions are skewed in all the best ways. Make ’em. Stuff them with goat cheese and a whole roasted almond, or blue cheese, or maybe even some pimento cheese. I simply made a chipotle-sriracha-mayo dipping sauce and was satisfied. 1.De-pit all of your dates, meaning snip a vertical cut into the flesh of your date and take out the pit in the center. 2. Cut all of your strips of bacon in half, horizontally, to make ten smaller strips. 3. Wrap each date with a single half-strip. Tuck one end of the bacon strip over the other and then skewer through with a toothpick to hold everything together, making sure to go through both ends of the bacon so it snugly wraps the date without falling apart. 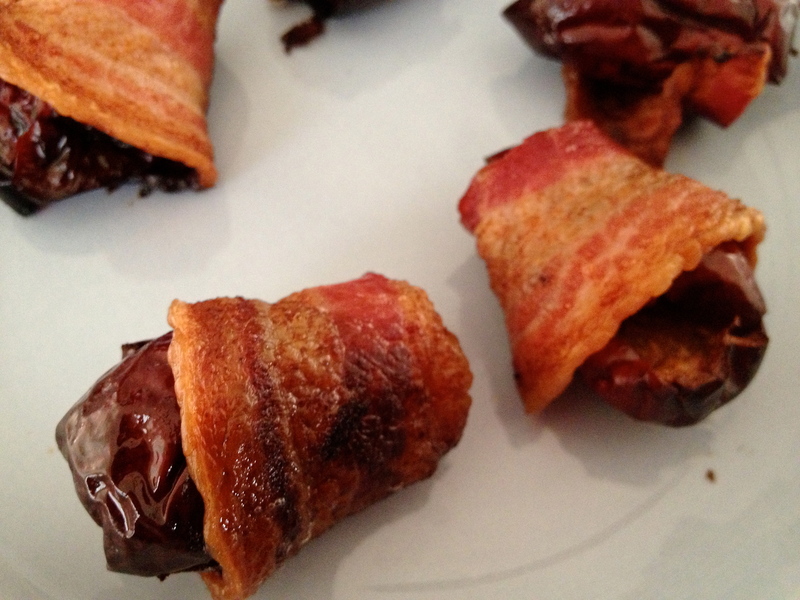 If you don’t have toothpicks, which I didn’t have either, simply place the bacon-wrapped dates down on the loose ends tucked under each other so the whole thing stays together in the oven. 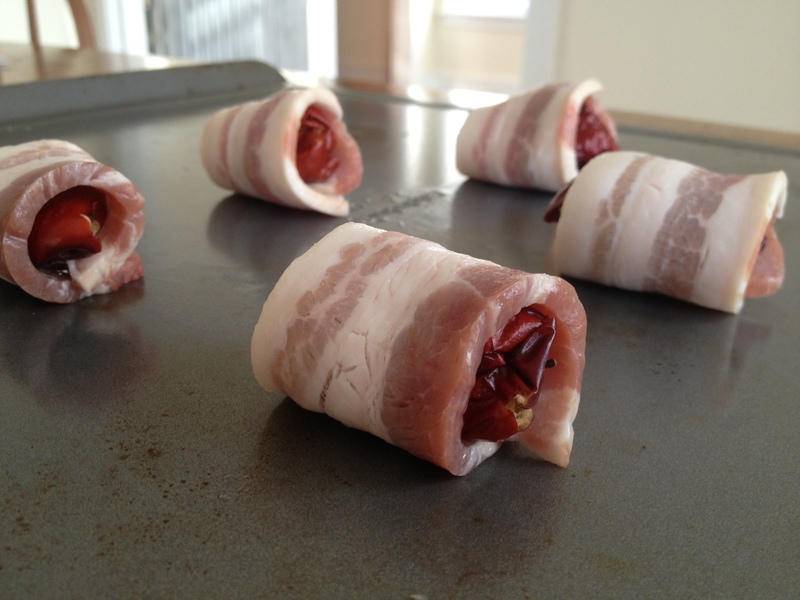 While the bacon bakes, it will bake into shape around the date. 4. Bake for 20-30 minutes in a 350°F oven. Let cool for a bit and enjoy! Mix together mayonnaise, Sriracha and Cholula to taste. I probably used about 2 teaspoons of the hot sauces each.